Red Bull Racing are back in Shanghai - ten years after they celebrated their first ever win in F1. On a rain-sodden Sunday afternoon, Sebastian Vettel, then in his first season with the team, led home team-mate Mark Webber for the Tilbrook squad's first win under their new owners. For some, it had been ten years since their last chequered flag - Johnny Herbert's shock European Grand Prix win in 1999. Now, in 2019, Red Bull head to Shanghai to celebrate another landmark, this time F1's 1,000th race. 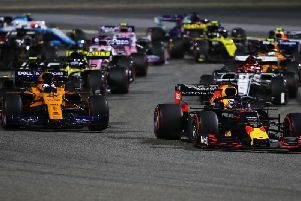 After a podium finish in the season opener in Australia, only a safety car in Bahrain denied Max Verstappen back-to-back third places, and given the anniversary of Red Bull's first win, the Dutchman hopes he can repeat the performance. "This year in Shanghai is also the tenth anniversary of the team’s first race win, so hopefully we can put on a good show, especially for the passionate fans there who always turn out," he said. "The Chinese Grand Prix is always a good one for racing because the track gives you a lot of opportunities for overtaking, so I’m looking forward to hopefully having an exciting race there. "The first sector is really nice because you can take a lot of different lines through the long right-hander so it can be quite interesting during the race in terms of trying to stay out of the dirty air. "We scored some good points and maximised the result in Bahrain but we still have a lot of things to learn about the car. We’ve been busy back at the factory and hopefully we can close the gap." Team-mate Pierre Gasly scored his first points since moving to the team in the winter in the last race, with na eighth place finish in Bahrain. He added: "I’m really excited to go racing again for the third round of the season. China is not actually a place I really know well and last year was my first race there but I’m looking forward to going back. "Red Bull took its first victory in China and this year’s race is also F1’s 1000th Grand Prix so it will be a special weekend.